George J. Borjas has been described by both Business Week and the Wall Street Journal as “America’s leading immigration economist”. He is the Robert W. Scrivner Professor of Economics and Social Policy at the Harvard Kennedy School. He is the recipient of the 2011 IZA Prize in Labor Economics. Professor Borjas is also a Research Associate at the National Bureau of Economic Research and a Research Fellow at IZA. Professor Borjas is the author of several books, including Heaven’s Door: Immigration Policy and the American Economy (Princeton University Press, 1999), and the widely used textbook Labor Economics (McGraw-Hill, 2012), now in its sixth edition. He has published over 125 articles in books and scholarly journals. He received his Ph.D. in economics from Columbia University in 1975. One of the most contentious issues in the debate over immigration policy, both in the United States and abroad, is the question of what happens to the employment opportunities of native-born workers after immigrants enter the labor market. Economic theory has straightforward and intuitive implications about what we should expect: Immigration should lower the wage of competing workers and increase the wage of complementary workers, at least in the short run. For example, an influx of foreign-born laborers reduces the economic opportunities for laborers — all laborers now face stiffer competition in the labor market. At the same time, high-skill natives may gain. They pay less for the services that laborers provide, and natives who hire these laborers can now specialize in producing the goods and services that better suit their skills. The theory also suggests that over time, as the economy adjusts to the immigrant influx, these wage effects will be attenuated. Despite the policy importance of this question, economists did not investigate whether these theoretical predictions were, in fact, observed in the United States until the early 1980s.1 The early studies inspired the growth of a vast academic literature that attempts to detect the presence and measure the size of the presumed wage effects. The academic literature has gone through several iterations and adopted several distinct methodological approaches, with some of the approaches claiming that immigrants have little impact on the wages of native-born workers, while other approaches conclude that such an effect exists and may be sizable. The past decade has witnessed the development of a theory-based approach to estimating the wage effects, implying that the academic literature has become increasingly technical (i.e., mathematical) and even less accessible to non-economists. As an example, instead of addressing directly the question of whether or not there is a wage effect, the recent literature has focused on two seemingly tangential questions: Are immigrants and natives who are equally educated and are roughly the same age substitutes or complements? Are high school dropouts and high school graduates interchangeable in the production process? To a non-economist, these questions will inevitably seem far removed from the issue at hand. Moreover, they address narrow topics that sound like relatively minor theoretical curiosities. Nevertheless, the answer to the fundamental question underlying the policy debate depends directly on the nature of these technological relationships. It turns out that the wage effect of immigration is quite different when immigrants and natives are complements in production, or when high school dropouts and high school graduates are interchangeable in production. My objective in this essay is to provide an easy-to-follow “English translation” of the state of academic research on the subject. The essay describes both what it is we can learn by simply looking at the “raw” data and emphasizes the increasing importance of unverifiable assumptions that are often made in the technical literature in order to interpret the data through a theoretical lens. Following a methodological approach introduced in Borjas (2003), many studies in the past decade estimate the labor market impact of immigration by examining how the evolution of wages in a narrowly defined skill group is affected by immigration into that group. The underlying approach is easy to explain: We can observe long-term wage trends in the U.S. labor market for specific skill groups (e.g., young high school graduates or college graduates in their late 40s). We can then attempt to determine if the wage trends are correlated with the entry of immigrants into that particular skill group. Presumably, those skill groups that experienced the largest “supply shocks” would be the ones where wages either fell the most or grew the least. This examination of wage trends across skill groups in the national labor market has much in common with the vast literature that attempts to identify the factors responsible for the increase in U.S. wage inequality over the past three decades. Many studies in that literature document that the size of the workforce that has a set of specific skills helps to determine the group’s relative wage.2 In other words, these studies — all done outside the immigration context — conclude that changes in the number of workers belonging to a particular skill group affect the employment opportunities faced by that group. As I shall discuss below, prior to the introduction of this approach, the immigration literature focused mainly on comparing outcomes in different cities to measure the impact of supply shifts on wages. In other words, the typical early study would compare labor market conditions in a city that received many immigrants to those in cities that received few immigrants, and infer the labor market impact from this “spatial correlation”. An important conceptual reason for shifting the unit of analysis away from a city and toward skill groups in the national labor market is to avoid the “contamination bias” that results from the fact that natives have an incentive to respond to supply shocks. If immigration worsens economic conditions in a particular city, then native workers, for instance, have an incentive to both move out of that city and not to move there. These flows diffuse the impact of immigration into geographic regions that were not directly affected by the immigrant influx. By shifting the focus of analysis to skill groups, the composition of the native workforce in each of the skill groups is relatively fixed, so that there is less potential for native flows to contaminate the comparison of outcomes across skill groups. After all, it is impossible for natives to suddenly become younger or older to avoid immigrant competition, and it is very costly (and would take some time) for natives to obtain additional education. To illustrate the nature of the evidence, I use decennial census data that summarize conditions in the U.S. labor market between 1960 and 2010. Specifically, I use data drawn from the 1960-2000 decennial censuses, and the pooled 2007-2011 American Community Surveys (ACS). For expositional convenience, I refer to the pooled ACS samples as the “2010 census”. These data sets are quite large. The 1960 and 1970 census datasets represent a 1 and 3 percent random sample of the population, respectively. Beginning in 1980, all of the datasets represent a 5 percent random sample of the population. I use these data to classify workers into skill groups defined by education and work experience.3 In particular, workers are classified into five distinct education groups: persons who are high school dropouts (i.e., they have less than 12 years of completed schooling), high school graduates (they have exactly 12 years of schooling), persons who have some college (they have between 13 and 15 years of schooling), college graduates (they have exactly 16 years of schooling), and persons who have post-college education (they have more than 16 years of schooling). Since an influx of, say, foreign-born college graduates in their early 20s is likely to have different labor market effects on young and old college graduates, I further classify skill groups in terms of the number of years that have elapsed since the worker completed school. I capture the similarity across workers with roughly similar years of experience by aggregating the data into five-year experience intervals, indicating if the worker has 1 to 5 years of experience, 6 to 10 years, and so on. There are, therefore, a total of 40 skill groups in the analysis (i.e., five education groups and eight experience groups). I define the “immigrant share” for each of these skill groups as the fraction of the workforce in that group that is foreign-born.4 The immigrant share obviously measures the size of the supply shock that affects the labor market for a particular skill group at a particular time. Figure 1 illustrates the supply shocks experienced by selected skill groups between 1960 and 2010. It is well known that immigration into the United States greatly increased the supply of high school dropouts in recent decades. What is less well known is that this supply shift did not affect all age groups within the population of high school dropouts equally. Moreover, the nature of the imbalance changed over time. As Panel A of the figure shows, immigrants made up almost 60 percent of all high school dropouts with around 20 years of experience in 2010, but only 30 percent of those with less than five years. In 1960, however, the immigration of high school dropouts most increased the supply of the oldest workers. Similarly, Panel B shows that in 1990 the immigrant supply shift for workers with more than a college education was reasonably balanced across all experience groups, generally increasing supply by around 10 percent. By 2010, however, the supply shift for these highly educated workers was far larger for those with less than 15 years of experience. It is easy to demonstrate the strong link that exists between trends in the wages of native-born workers and the immigrant share within these schooling-experience groups. In particular, Figure 2 presents the scatter diagram relating the change in (log) weekly earnings for each group to the change in the immigrant share for that group, after removing decade effects from the data.5 The figure clearly documents a negative relation between the growth in weekly earnings and immigration. Put simply, the raw data at the national level show that weekly earnings in any particular decade grew most for workers in the skill groups least affected by immigration in that decade. These data can be used to estimate a multivariate regression model that relates changes in (log) weekly earnings for a particular group to the change in the immigrant share for that skill group. It is worth emphasizing that this statistical framework adjusts for changes in labor market conditions between 1960 and 2010 that might affect wages differentially for the various skill groups. In rough terms, the regression framework generates a trend line similar to the one illustrated in Figure 2, but one that also controls for the fact that the returns to skills were changing over the past few decades due to many other reasons.6 The slope of this trend line then gives the wage impact of immigration. It is also interesting to determine if these adverse wage effects are observed in specific racial or ethnic groups.8 The remaining rows of Table 1 report the estimated wage effects when the model is estimated separately in the samples of native-born black, Hispanic, and non-Hispanic white workers.9 In all cases, it is evident that the wage of each native group falls whenever immigration increases. In the case of blacks, for example, a 10 percent increase in the size of the skill group lowers the wage of blacks in that group by around 2 percent. In the case of native-born Hispanics, the wage would drop by 3 to 4 percent. The simple methodology underlying the national-level approach has inspired a number of replications in other countries. One particularly interesting context is given by the Canadian experience. Since 1967, Canada has used a “point system” aimed explicitly at selecting high-skill immigrants. The point system awards points to visa applicants who have particular socioeconomic characteristics (e.g., more schooling and fluent English or French language skills), and then sets a passing grade that determines which applicants qualify for a visa. The first row of Table 2 reports that a 10 percent immigration-induced increase in the size of a skill group in Canada lowers the wage of that group by 3.5 percent. In contrast, Mexico is a major source country for international migrants, with almost all of the emigrants moving to the United States. Mishra (2007) merged data from the Mexican and U.S. censuses to calculate an out-migration rate for each education-experience group and then estimated a regression model that related the earnings of Mexicans who stayed in Mexico to the outmigration rate in their skill group. She found a strong positive correlation between the earnings of Mexican stayers and the size of the outflow. A 10 percent reduction in the size of a skill group in Mexico raises the wage of the Mexicans who stayed behind by 3.1 percent. Finally, several studies have replicated the analysis in the European context. In Germany, for example, the immigrant share increased significantly in the 1990s. Some of the German studies report a significant, though weaker, negative correlation between immigration and the wage growth of specific skill groups in the German labor market, even though wages are thought to be relatively rigid in Germany. A 10 percent increase in supply lowers the wage of native-born Germans by 1 to 2 percent. Similarly, the fraction of the workforce that is foreign-born in Norway increased from 2 to 10 percent in the past three decades. Using administrative data that cover all workers in Norway from 1993 through 2006, a recent study found that a 10 percent increase in the size of the skill group reduced the wage of native-born Norwegians by 2.7 percent. In sum, the descriptive national-level data confirm the common-sense expectation that an immigration-induced increase in the size of a particular skill group is associated with a decline in the wage of that skill group, both in the United States and abroad. It is important, however, to emphasize that although this adverse wage effect is costly for some (i.e., for the affected workers), it can create benefits as well. The benefits will be discussed below. Although the descriptive approach presented in the previous section provides an easy-to-understand framework for measuring the labor market impact of immigration, it does not fully capture how immigration changes labor market opportunities for the native-born. After all, the entry of immigrants into one skill group affects not only the wage of that skill group, but the wage of every other group as well. For example, the entry of young high school dropouts could influence the wage of young, high school dropouts and the wage of young and old college graduates. The scatter diagram in Figure 2 suggests that the descriptive approach ignores all of these potentially important “cross-effects”. The problem with measuring the magnitude of the cross-effects is that the empirical exercise quickly becomes an intractable problem. The analysis summarized in the previous section, for example, used 40 skill groups, composed of five education groups and eight experience groups. A fully general approach would imply that there are 1,600 (or 40 * 40) effects to measure if we truly wanted to describe the complete impact of immigration on the wage structure. After all, immigration into one group affects that group’s wage, as well as the wage of 39 other groups. This type of framework would quickly run out of available data, and would lead to results that had little empirical plausibility. To measure the cross-effects, therefore, it is crucial to reduce the dimensionality of the problem. Put differently, any study of these cross-effects must narrow the scope of the problem by relying on a model derived from economic theory. The theory-based approach begins by specifying a “production function” that delineates how various types of labor and capital interact in the production process, and then assumes that workers are paid the value of their contribution to the firm’s revenue (a standard result in labor markets that are competitive). The assumption of a specific formula for the production function permits the estimation of the complete set of effects that determine how immigration alters the entire wage structure. One particularly tractable approach has become widely used since its introduction into the immigration literature by Borjas (2003). That study assumed that the technology of the labor market could be represented by a three-level nested CES production function (where “CES” stands for Constant Elasticity of Substitution). 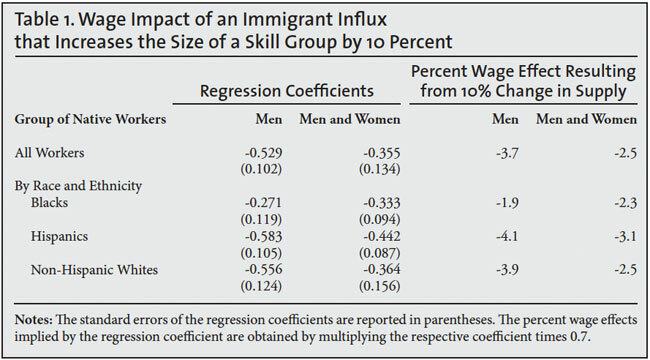 The wage effects resulting from immigration in this theory-based approach depend specifically on the extent to which various groups, including immigrants and natives, are substitutes or complements in the production process. Since much of the subsequent debate over the wage impact of immigration has focused on these technological relationships, it is crucial to understand the nature of the theoretical and empirical exercise. Figure 3 presents a schematic diagram describing the nature of the nesting. Level 1: The workforce in a particular education group contains workers who are relatively young (and have little work experience) and workers who are older (and have much more work experience). The “effective” labor input provided by this education group aggregates the contribution made by workers in each of the different experience groups. However workers in each of these experience groups may contribute differently to the calculation of the effective labor input provided by the specific education group. This level introduces an important variable: the elasticity of substitution across experience groups. This elasticity details how easy it is to substitute workers who are young with workers who are older. The elasticity would be close to 0 if younger and older workers (within an education group) were not easily substitutable, and would be very large if they were. Level 2: The total “effective” labor input in the U.S. labor market is defined by some aggregation of the contributions made by the five education groups defined in Level 1 (high school dropouts, high school graduates, etc.). However, the different education groups contribute differently to the aggregate labor input. This level introduces another important variable: the elasticity of substitution across education groups. This variable measures how easy it is to substitute workers in one education group with workers from another group. This elasticity would again be close to zero if workers in different education groups were not easily substitutable, and would be very large if the workers were easily substitutable. Level 3: The aggregate output of the United States is produced by combining labor and capital, where labor is measured by the total number of “effective” labor units contributed by the many different types of workers who participate in the labor market. This level introduces a final variable into the framework: the elasticity of substitution between labor and capital. This elasticity is close to zero if labor and capital are not easily substitutable, and is very large if labor and capital are easily substitutable. Despite the superficial complexity introduced by thinking about the labor market in this nested fashion, the framework has three features that make it extremely useful for measuring the wage impact of immigration. First, it greatly reduces the dimensionality of the problem. As noted above, we would need to estimate 1,600 different wage effects to fully capture how immigration affects the entire wage structure. The nested framework drastically reduces the dimensionality of the problem: The technology can be summarized in terms of the three elasticities of substitution defined above. Second, the framework is easily estimable using the national-level census data by education and experience introduced in the descriptive analysis earlier. Specifically, the data on wages, employment, and immigration in each of the 40 skill groups can be used to estimate two of the three elasticities of substitution: the elasticity of substitution across education groups and the elasticity of substitution across experience groups. Finally, the framework can be easily extended to include other considerations. For example, there has been a lot of interest in the possibility that there exists a fourth level in the nesting. Specifically, the effective labor input of workers who belong to one of the 40 skill groups (e.g., high school dropouts in their early 30s) can be viewed as composed of the contribution of native-born and foreign-born workers in that skill group. Immigrants and natives in that skill group need not be “perfect substitutes” so that the entry of immigrants in that skill group “complements” their native counterparts, and makes natives more productive. I initially assume that immigrants and natives within a skill group are interchangeable, but I will return to a full discussion of this issue in the next section. Once we know how easy (or hard) it is to substitute workers in different skill groups, the main “deliverable” from this type of analysis is a simulation of how a particular level of immigration affects the wage structure. In other words, once we know the value of the various elasticities of substitution, it is a simple matter to “grind through” the model and find out what happens to wages if, say, immigration increased the supply of the various skill groups by a certain number. This type of simulation is often done both in the short run and in the long run. The short-run wage effects measure the impact of immigration on the wage structure before the economy has adjusted to it in any way. Since immigration changes economic opportunities for many groups, the economy is likely to adjust over time. For example, employers may wish to expand to take advantage of the lower wages, increasing their investments in capital. By definition, in the long run, all adjustments that could have taken place will have taken place. We do not know if the long run is reached within a year, a decade, a few decades, or, as Keynes put it, “after we are all dead”. Nevertheless, the two simulations can be interpreted as giving numerical bounds for the wage effects of immigration. It is important to emphasize that there is one variable that has not been estimated directly by the immigration literature, but is instead assumed to take on a specific value: the elasticity of substitution between labor and capital. Because of various methodological difficulties, the studies in the literature simply make an assumption about the value of this elasticity.10 Specifically, they assume that this elasticity takes on a value of 1.0 — or, equivalently, they assume that the production function in the U.S. economy that combines labor and capital to produce output is given by what is known as a “Cobb-Douglas production function”.11 This assumption is not innocuous. The estimation of the model using the wage and employment data for each of the 40 education groups in the national labor market between 1960 and 2010 yields estimates of two elasticities of substitution. They are 6.7 for the elasticity of substitution across experience groups, and 5.0 for the elasticity of substitution across education groups.12 To get a rough idea of what these numbers mean: An elasticity that is close to zero would imply that the groups are “perfect complements” while an elasticity that is very large (i.e., infinity) would imply that the groups are “perfect substitutes”. These elasticities can be used to simulate the wage impact of the immigrant influx that entered the United States between 1990 and 2010. Panel A of Table 3 summarizes the results of the simulation. In particular, the table uses the estimated elasticities of substitution to calculate the percent wage change resulting from the actual supply increase. The first row of Table 3 shows that immigration particularly increased supply at the bottom and top of the education distribution. Immigration increased the effective number of hours supplied by high school dropouts by 25.9 percent, and those of workers with more than a college degree by 15.0 percent. In contrast, immigration increased the number of hours supplied by workers with 12 to 15 years of school by only 6 to 8 percent. Overall, immigration increased effective supply by 10.6 percent during the two-decade period. Because of the skewed nature of the supply shift, the simulation shows that immigration particularly affected the wage of native workers at the two ends of the education distribution. The large supply increase experienced by high school dropouts reduced the wage of this group by 6.2 percent in the short run and 3.1 percent in the long run. Similarly, the wage declines for the most highly skilled workers (those with more than a college degree) were 4.1 percent in the short run and 0.9 percent in the long run. The last row of the table reports the average earnings for each education group. By multiplying the percent wage effects by average earnings, it is easy to calculate the dollar loss resulting from the supply shock: The earnings of native-born high school dropouts are predicted to fall by some amount between $650 and $1,300, while the earnings of native-born post-graduates fall by $800 to $3600. If we take the weighted average of the wage effects across education groups, we find that the average wage of a pre-existing worker fell by 3.2 percent in the short run and 0.0 percent in the long run. It is important to emphasize a technical point that has not been sufficiently appreciated in the immigration debate: These average wage effects have nothing to do with the underlying data. As I discuss in the Technical Appendix, they are the mechanical predictions of the Cobb-Douglas assumption mentioned earlier. This assumption builds in the fact that the average wage effect in the long run must equal 0.0 percent, regardless of the size of the immigrant influx. Similarly, the assumption builds in the fact that the average wage effect in the short run must equal the product of -0.3 and the size of the supply shift (i.e., -3.2 percent equals -0.3 times 10.5). The mechanical nature of the predicted impact of immigration on the average wage level suggests that we should be prudent when interpreting the wage effects implied by the simulation. The observed data simply help to “place” the wage effect for each of the education groups around the mechanically predetermined average wage effect. The Cobb-Douglas assumption algebraically implies that the average wage effect in the long run must have been 0.0 percent. Therefore, some education groups must have experienced a wage loss that is somewhat larger than zero, while other education groups must have experienced a somewhat smaller wage loss. The mechanical nature of the average wage effect suggests that the only valuable results that come out of the simulation deal with the impact of immigration on relative wages. In other words, immigration led to a 3 percent decline in the wage of high school dropouts relative to that of college graduates, and this is true both in the short run and the long run. Immigration, therefore, is implied to have reduced the relative earnings of high school dropouts by around $600. Let me conclude by addressing a point that is often brought up in the policy debate. Immigration has its largest negative impact on the wage of native workers who did not graduate from high school, a group that makes up a modest (and, in recent decades, shrinking) share of the workforce. However, these workers are among the poorest Americans. According to the 2012 Current Population Survey, 22.3 percent of all adults 18-64 who are in poverty (and out of school) are high school dropouts. Similarly, the children of these workers make up a disproportionate number of the children in poverty: 24.8 percent of all children of the native-born working poor live in households headed by a high school dropout. In short, although native-born high school dropouts may make up a small fraction of the native-born population, they are particularly vulnerable to the adverse wage effects of immigration. With a model of the U.S. economy in place, the simulation exercise can now be adapted to examine the wage impact of immigration under many different scenarios. In particular, the exercise can be used to get a sense of the magnitude of the impact of illegal immigration on the U.S. wage structure. Between 1990 and 2010, the number of illegal immigrants rose from 3.5 to 11.7 million, while the total number of foreign-born persons rose from 19.8 to 40.0 million.13 The labor market data from the various censuses indicate that the number of foreign-born persons in the workforce rose from 9.3 to 21.4 million over the same period.14 If we assume that the increase in the number of undocumented workers in the labor market was proportional to their increase in the population, the number of undocumented workers rose from 1.6 to 6.3 million. We can then allocate the increased number of undocumented immigrants to the various education groups using the information provided in Passel and Cohn (2009) and work through the simulation exercise assuming that no illegal immigrants entered the country in those two decades.15 The bottom panel of Table 3 reports the results of the simulation. Not surprisingly, the increase in the supply of low-skill workers, particularly high school dropouts, would have been much smaller had there been no illegal immigration. In the absence of illegal immigrants, immigration would only have increased the supply of high school dropouts by 4.4 percent, as compared to the rise of 25.9 percent that actually occurred. The wage effects on the low-skill workforce would also have been much smaller. 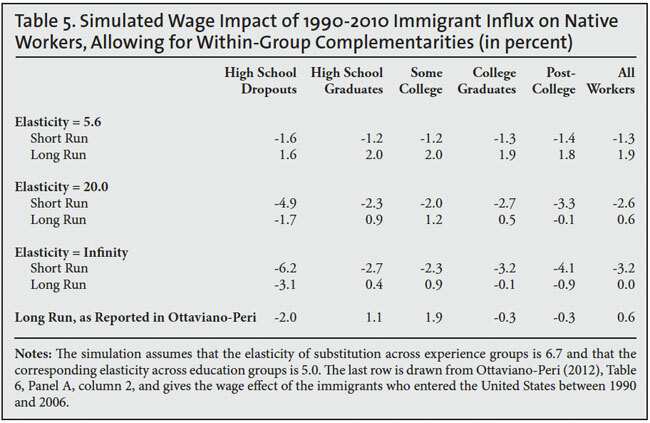 The short-run wage effect on high school dropouts would have been -1.7 percent, as compared to the -6.2 percent implied by the actual immigrant flows. In fact, in the absence of illegal immigration, immigration would have had little impact on relative wages, since the short-run wage effect is between 2 and 3 percent for almost all groups. Nevertheless, a comparison of the two panels of the table suggests that illegal immigration was probably responsible for around a 4 percent decline in the wage of high school dropouts (relative to college graduates), both in the short and long runs (or around $800). 4. Are Immigrants and Natives Complements? Up to this point, the analysis has assumed that immigrant and native workers belonging to a particular skill group (i.e., immigrants and natives who are equally educated and have the same age) are interchangeable in production or, more precisely, “perfect substitutes”. The question of whether there is within-group imperfect substitution — giving rise to potential complementarities between similarly skilled immigrants and natives — has been studied extensively in the past decade, particularly by Ottaviano and Peri (2006, 2012), who report finding evidence of within-group complementarity. 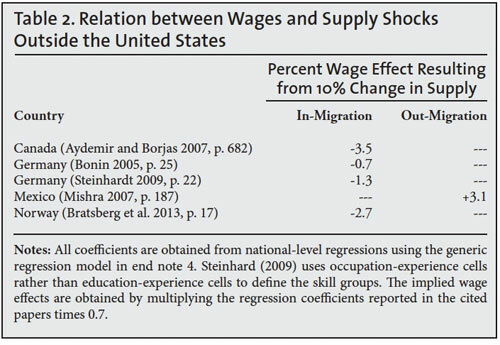 In fact, in the initial 2006 version of their work, they concluded that the complementarities were sufficiently strong that an immigration-induced supply shock would increase the wage of almost all native workers. Level 0: The “effective” labor input contributed by workers in a particular education/age group is obtained by aggregating the supplies offered separately by native- and foreign-born workers in that group. Immigrants and natives in this narrowly defined group may contribute differently to the total labor input provided by that group. This level introduces a fourth variable: the elasticity of substitution between immigrants and natives. This elasticity would be close to zero if immigrants and natives were not easily substitutable, and would be very large if they were. It is important to emphasize that the nature of the complementarity measured at this fourth level of the nesting is very narrow. It does not describe how low-skill immigrants and high-skill natives may interact in the production process — which is the type of complementarity that many would think to be empirically relevant in the context of the U.S. labor market. Instead, it describes the potential complementarities that may arise when a 30-year old foreign-born high school dropout interacts with a 30-year old native-born high school dropout. In contrast to the complementarities between high- and low-skill workers, it is far from obvious how within-group complementarities would arise; let alone whether they might be numerically important. There has been a debate in the academic literature as to the value of the elasticity of substitution between equally skilled immigrants and natives. Table 4 summarizes the intellectual history. 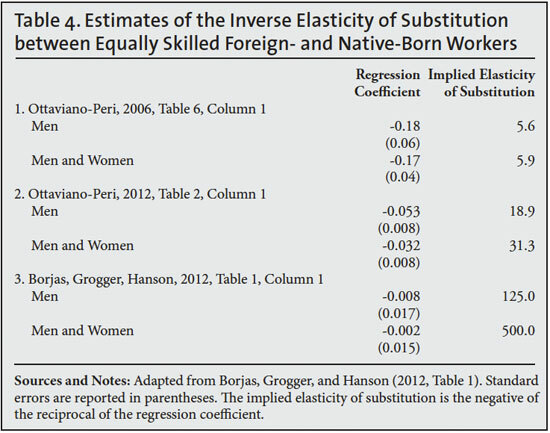 The first row of Table 4 reports the value of the elasticity of substitution between immigrants and natives estimated in Ottaviano and Peri’s (2006) original study, which was an elasticity of 5.6. As I will show below, this value of the elasticity, if correct, is indeed sufficiently close to zero to reverse the finding that many pre-existing native workers were adversely affected by immigration. The second row of the table, however, shows that addressing and correcting a number of data issues in the original study led to a sizable upward revision in the value of the elasticity of substitution. Specifically, Borjas, Grogger, and Hanson (2008) documented that the estimated value of 5.6 was directly attributable to a strange feature of the data used in the original Ottaviano-Peri study. In particular, Ottaviano and Peri used a sample of workers aged 17-65, but did not exclude persons who were enrolled in school. As a result, millions of native-born high school juniors and seniors were mistakenly classified as “high school dropouts”, since they did not yet have a high school diploma. In the published version of their study, after correcting for some of these issues, Ottaviano and Peri (2012) report that the value of the elasticity is around 20, which implies far less complementarity between equally skilled immigrants and natives. In fact, if the published version of the elasticity were correct, the inference would have to be “that there is a very modest degree of imperfect substitutability” between immigrants and natives (Lewis, 2012, p. 4, italics added). It turns out, however, that even an elasticity of 20 exaggerates the immigrant-native complementarity that is actually found in the census data. In a paper published alongside the Ottaviano-Peri study, Borjas, Grogger, and Hanson (2012) replicated the Ottaviano-Peri analysis and found that the estimate of the elasticity would have been even larger if Ottaviano and Peri had used operational assumptions that are widely accepted in the labor economics literature.16 The third row of Table 4 reports the estimated elasticity resulting from the use of the standard assumptions and the estimate increases to 125, a number that is statistically equivalent to the hypothesis that immigrants and natives are perfect substitutes. In sum, the evidence suggests that within-group complementarities between foreign- and native-born workers are not an important factor in an assessment of the labor market impact of immigration in the United States. 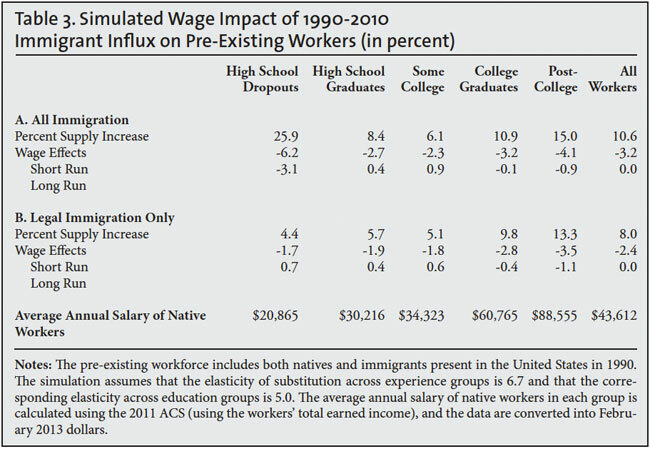 Table 5 summarizes the importance of the assumed value of the elasticity of substitution between equally skilled immigrants and natives in simulations of the wage impact of immigration. To illustrate, I use three alternative values of the elasticity: 5.6, 20, and infinity. The elasticity of 5.6 was the value reported in the original Ottaviano-Peri (2006) study; an elasticity of 20 is the estimate in the Ottaviano-Peri (2012) published article; and an elasticity of infinity (or perfect substitution) is what is actually revealed by the census data. The simulation indeed shows that all native groups would benefit from immigration in the long run if there were strong complementarities between equally skilled immigrants and natives. Note, however, that the “corrected” estimate of the elasticity (which brought its value up to 20) is, for most purposes, operationally equivalent to the assumption that the two groups are perfect substitutes. The short-run wage decline experienced by native high school dropouts is -4.9 percent when the elasticity is 20 as compared to -6.2 percent when the two groups are perfect substitutes. 5. Are High School Dropouts and High School Graduates Interchangeable? As I noted earlier, the aggregation of workers into a manageable number of skill groups is a crucial step in any empirical analysis of the impact of immigration on the wage structure. In the United States, immigration has disproportionately increased the size of specific education groups, such as high school dropouts and workers with post-college degrees. Not surprisingly, the economics literature has focused on estimating the impact of immigration on those particular groups. It is inevitable, however, that different definitions of the education groups can lead to very different conclusions about the wage impact of immigration. It is easy to see why. As reported in Table 3, the immigrants that entered the United States between 1990 and 2010 increased the number of high school dropouts by 25.9 percent and that of high school graduates by only 8.4 percent. These dramatic differences in the size of the supply shift necessarily imply that the wage of high school dropouts suffered a much greater shock than the wage of high school graduates. Suppose, however, that the low-skill workforce is composed of high school dropouts and high school graduates, and that these two groups are interchangeable or “perfect substitutes”. The percent increase in the number of low-skill workers due to immigration would then be numerically small. After all, the large number of immigrants who are high school dropouts would be swamped by the far greater number of natives who are high school graduates. In percentage terms, therefore, immigration would not have generated a sizable increase in the size of the low-skill workforce, and the estimated wage impact would be correspondingly smaller. There are, in fact, precedents for pooling high school dropouts and high school graduates in economics. Much of the literature that examines the increase in wage inequality in the United States over the past three decades has found it convenient to discuss trends in the returns to skills by examining the wage gap between two broadly defined education classifications, “high school equivalents” (defined as an aggregation of high school dropouts and high school graduates), and “college equivalents” (defined as an aggregation of workers who have more than a high school diploma). Beginning with Card (2009), some studies argue that the high school equivalents-college equivalents classification should be adopted in the immigration literature.18 This argument adds a fifth level to the nesting, one that describes how high school dropouts and high school graduates interact in the production process. The key variable in this level of the nesting would be the elasticity of substitution between high school dropouts and high school graduates. This elasticity would be close to zero if the two groups were not easily substitutable, and would be very large if the workers were easily substitutable. Operationally, the elasticity of substitution between high school dropouts and high school graduates is estimated by correlating the percent wage gap between the two groups with the (log) ratio of the quantities in the two groups. In the national labor market, we would observe the wage gap and the quantity ratio once per year, so that there are only a few observations if we were to use decennial census data. As a result, most studies use the annual Current Population Surveys (CPS) data, which exists since 1964, to estimate these types of elasticities. The numerical exercise, however, quickly runs into a major obstacle. The sign and magnitude of any correlation between the wage gap and the quantity ratio of the two low-skill education groups is going to be contaminated by the changes in the demand for different types of low-skill workers witnessed in the U.S. labor market over the past few decades. The calculation of the correlation, therefore, must find a way of controlling for these unobserved demand shifts. It is typical to address this problem by controlling for some sort of trend in the regression model. 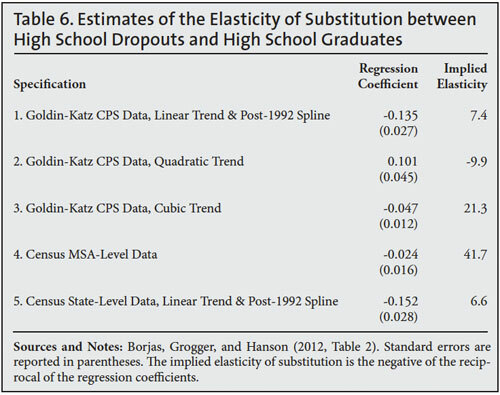 Goldin and Katz (2008), for example, introduce a linear trend with a “spline” (i.e., a break) after 1992 to estimate the elasticity of substitution between high school dropouts and high school graduates. Table 6 illustrates the sensitivity of the measured elasticity to alternative assumptions about the unobserved trend in relative demand. The first row reports the estimated elasticity using the Goldin-Katz CPS data from the 1963-2005 period and their preferred trend specification.19 The estimate of the elasticity is 7.4, and rejects the hypothesis that high school dropouts and high school graduates are perfect substitutes. The other rows reported in the table use alternative trend assumptions. It is obvious that the estimated elasticity is sensitive to the shape of the trend. Row 2, for example, uses a quadratic trend, and the estimated elasticity has the wrong sign (i.e., the elasticity should be a positive number), so that the entire theoretical framework falls apart. Row 3 uses a cubic trend, and the elasticity takes on a value of 21.3. Card (2009) introduced an approach that would seem to avoid some of the pitfalls inherent in making assumptions about the underlying trends in demand. He correlated the wage gap and quantity ratio of high school dropouts and high school graduates across cities in the United States. As row 4 of the table shows, this cross-city correlation does indeed lead to the conclusion that the two groups are near-perfect substitutes, with an elasticity equal to 41.7. However, row 5 shows that if the model were estimated across states (rather than across cities) and allowed for state-specific trends in relative demand for low-skill workers, the estimated elasticity would fall to 6.6, suggesting little substitutability between the two groups. Table 6 teaches us a very important lesson: The available evidence on the elasticity of substitution between high school dropouts and high school graduates is extremely sensitive to the assumption made about the trend in the relative demand for the two groups. Different assumptions yield very different conclusions. In fact, the sensitivity of the results suggests that the nested CES framework may not be a particularly useful method for analyzing the substitutability of labor between these two skill groups. 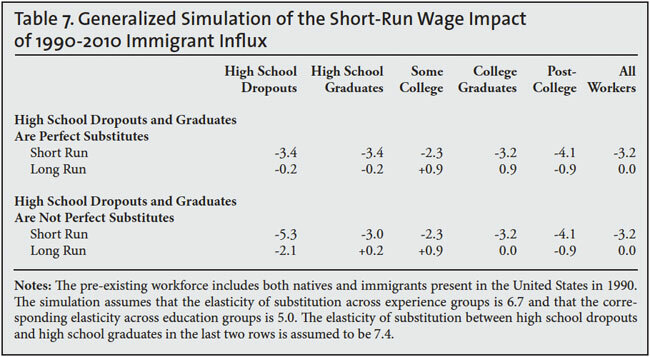 It is useful to report the findings of one final simulation exercise to get a sense of the importance of the assumed value of the elasticity of substitution between high school dropouts and high school graduates in predicting the wage impact of immigration. Table 7 presents the results of the simulation using two alternative values for the elasticity: 7.4 (the value implied by the Goldin-Katz CPS data in row 1 of Table 6); and infinity (the value reflecting the presumption that the two groups are perfect substitutes). The simulation assumes, as shown earlier, that immigrants and natives within narrowly defined skill groups are perfect substitutes. Not surprisingly, immigration has a much weaker impact on the wage of low skill workers when high school dropouts and high school graduates are perfect substitutes. For example, the short-run wage impact on high school dropouts is -3.4 percent if the two groups are perfect substitutes, but -5.3 percent if the elasticity is around 7. The source of the weaker impact in the case of perfect substitution is obvious. 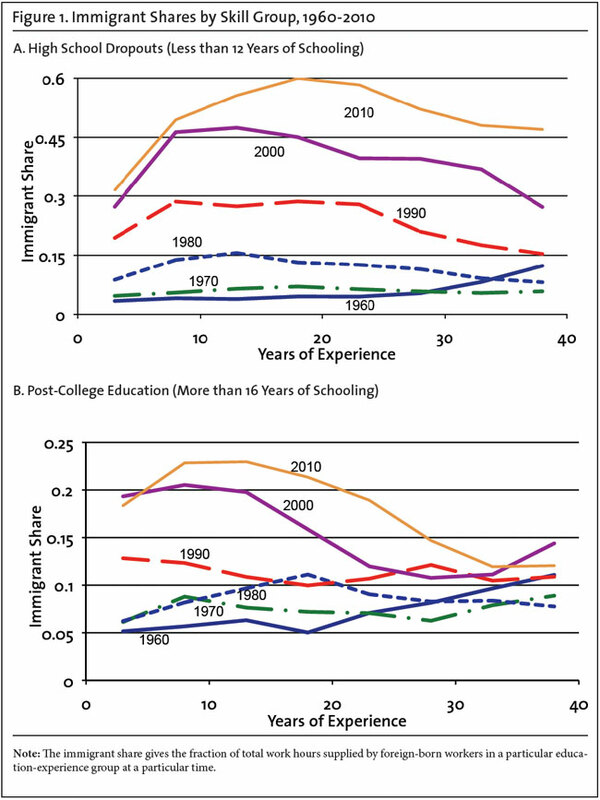 As noted above, because immigration disproportionately increased the number of high school dropouts in the United States, the identification of high school dropouts as a unique skill group implies that this group experienced a very large supply shock. By pooling high school dropouts and high school graduates into “high school equivalents”, the magnitude of the percent supply increase in the low-skill workforce becomes much smaller, and the relative wage impact on low-skill workers gets diluted. Let me conclude the discussion of the theory-based methods of estimating the wage impact of immigration by noting an incongruity in the two hypotheses that circulated in the past decade that lead to a weaker wage impact of immigration. In particular, it has been argued that: (a) equally-skilled immigrants and natives are complements; and/or (b) high school dropouts and high school graduates are perfect substitutes. Although this particular combination of assumptions may, from some perspectives, give the “right” answer, the cognitive dissonance inherent in the argument is often overlooked. It requires a belief that somehow workers who most observers view as different (high school dropouts and high school graduates) are, in fact, identical; while workers who most observers would view comparably (similarly aged and educated foreign- and native-born workers) are, in fact, different. Although algebraically possible, it seems like a peculiar mix of technological assertions. Although the theory-based approach discussed above seems to have become a preferred way of measuring the wage impact of immigration in the past decade, there exists an alternative literature in economics that is much more descriptive and that focuses entirely on comparing economic conditions across cities. It seems sensible to presume that we should be able to measure the wage impact of immigration by comparing how wages evolve in cities that are affected differentially by immigration. The wages of substitutable workers, for instance, should decline more in those metropolitan areas that received a larger immigrant influx. Although there is a great deal of dispersion in results across the hundreds of studies in the academic literature, the cross-city studies generally find that immigration has only a weak effect on wages. It is widely recognized, however, that the cross-city estimates suffer from two potentially serious flaws. First, immigrants may not be randomly distributed across metropolitan areas. If the areas where immigrants cluster have done well over some time periods, this would create a positive spurious correlation. A positive correlation between wages and immigration may simply indicate that immigrants choose to reside in areas that are doing relatively well, and the spurious correlation could easily swamp the presumed negative effect of immigration on the wage of competing workers. A second difficulty is that natives may respond to the entry of immigrants in a particular locality by moving their labor or capital to other places until native wages and returns to capital are again equalized across regions. A comparison of the wage of native workers across cities or states might show little or no difference because the internal flows have diffused the effects of immigration throughout the national economy. There is a classic study in the literature, however, that is unaffected by these flaws and that also concludes that immigration had little effect on the employment opportunities of native workers. I am referring, of course, to Card’s (1990) study of the impact of the Mariel influx on Miami’s labor market. On April 20, 1980, Fidel Castro declared that Cuban nationals wishing to move to the United States could leave freely from the port of Mariel. By September 1980, about 125,000 Cubans, mostly unskilled workers, accepted Castro’s offer and Miami’s labor force grew by 7 percent. Card (1990) used a very simple methodology to determine if this “natural experiment” affected labor market opportunities for Miami’s pre-existing workforce. Table 8 summarizes some of the evidence by looking at the unemployment rate of black workers in Miami before and after the Mariel influx. In 1979, prior to the Mariel flow, the black unemployment rate in Miami was 8.3 percent. This unemployment rate rose to 9.6 percent by 1981, after the Mariel flow. Of course, this fact by itself does not imply anything about the labor market impact of immigration. In order to isolate this impact, we need to compare what happened in Miami with what happened in a “control group”, a set of cities that were untouched by the Mariel influx. As the table shows, black unemployment was rising even faster in the other cities that form the control group (as the aggregate economy was entering a recession), from 10.3 to 12.6 percent. If anything, therefore, it seems that the Mariel flow actually attenuated the rise in black unemployment in Miami. Given the short-run nature of the empirical exercise (the changes in Miami’s labor market over a two-year period), it would be difficult to argue that the Mariel study captures the long-run attenuation of whatever short-run effect might have occurred. Subsequent research, however, raises questions about whether the Mariel data justifies any inference about the impact of immigration. In 1994, economic and political conditions in Cuba were ripe for the onset of a new refugee influx into the Miami area, and thousands of Cubans began the journey. To prevent a “new” Mariel from occurring, however, the Clinton administration ordered the Navy to redirect all the refugees toward the American military base in Guantanamo. As a result, few of the potential migrants reached Miami. Angrist and Krueger (1999) replicated the methodological design of the Mariel study by comparing Miami’s labor market conditions — relative to those in the same control group —before and after “the Mariel boatlift that didn’t happen”.20 This non-event had a remarkable adverse impact on the unemployment rate of Miami’s black workforce. Table 8 shows that the black unemployment rate in Miami rose from 10.1 to 13.7 percent between 1993 and 1995, as compared to a drop from 11.5 to 8.8 percent in the control group. Interpreted in the usual way, the evidence would suggest that a phantom immigrant influx greatly harmed the economic opportunities of black workers. This nonsensical inference obviously raises questions about whether one should interpret the evidence for the Mariel boatlift that did happen as indicating that immigration had little impact on Miami’s labor market. The conflicting evidence is probably best interpreted as indicating that local labor markets are continually affected by many shocks, and it is impossible to draw specific conclusions about the wage impact of immigration unless we have a much better understanding of the many other factors that are shifting supply and demand in these labor markets at a particular point in time. Put simply, cross-city comparisons do not seem to measure the labor market impact resulting from an immigration-induced supply shift. The debate over the measurement of the wage effects of immigration is often motivated by the intrinsic interest in determining how immigrants alter labor market opportunities for native workers. There exists, however, another equally important reason for measuring the wage effects: the gains to the U.S. economy directly depend on the impact of immigration on native wages. Natives benefit from immigration in many ways. For example, immigrants buy goods and services produced by American firms, increasing the demand for native workers; they can lower the price of services in many industries, such as construction, benefiting American consumers; and immigrant entrepreneurs open up firms, create jobs, and possibly make a large contribution to economic growth. To measure the economic gains from immigration, we would need to list all the possible channels through which immigrants transform the economy. We could then use this exhaustive list to estimate what the gross domestic product (GDP) of the United States would have been if the country had not admitted any immigrants. The difference between the counterfactual GDP and actual GDP yields the increase in national wealth attributable to immigration. The calculation could also be used to determine how much of the increase in GDP accrues to natives as opposed to being paid directly to immigrants in return for their services. Obviously, this computation is an extremely difficult, if not impossible, task. As a result, we can only estimate the economic benefits from immigration if we have a model of the economy detailing how the various sectors operate and are linked together. One could then simulate the model to figure out what happens when the labor market is flooded by millions of new workers. Existing estimates of the economic benefits from immigration often use the simplest “textbook model” of a free-market economy to calculate the benefits. In this framework, wages and employment are set by the interplay between the supply of and the demand for workers. When wages are high, many persons want to work, but few firms are looking to hire. When wages are low, few persons want to work, but many firms are competing for their services. The labor market balances out the conflicting interests of workers and firms, and sets employment and wages so that persons who want to work at the going wage can find jobs. So what happens in this idealized model when immigrants enter the labor market? And, equally important, what happens to the income that accrues to the native population? Suppose that all workers, whether immigrants or natives, are equally skilled. Because immigrants increase the size of the workforce, there is additional competition in the labor market and the wage of native workers falls. At the same time, native-owned firms gain because they can now hire workers at lower wages, and many native consumers gain because the lower labor costs lead to cheaper goods and services. The difference between what the winners win and what the losers lose is called the immigration surplus, and it gives the gain in national income accruing to natives as a result of immigration. p is the fraction of the workforce that is foreign-born, which is around 0.15. The formula for the immigration surplus in a competitive labor market is so simple that practically anyone can conduct a back-of-the-envelope calculation of the gains, and “play around” with the numbers to get a good sense of the range of the estimates. Suppose, for example, that the wage elasticity is -0.3, which implies that a 10 percent increase in the number of workers lowers wages by 3 percent. The immigration surplus would then be around 0.24 percent of GDP (which equals 0.5 * 0.7  0.3 * 0.15 * 0.15). In 2013, GDP is around $15 trillion. As Table 9 shows, the formula for the immigration surplus implies that immigration increases the income accruing to the native-born by around $35 billion annually. Needless to say, this estimate of the immigration surplus depends on the many assumptions that underlie the model. Nevertheless, the model says something that is useful and surprising: It is mathematically impossible to manipulate the textbook model of a competitive labor market so as to yield a huge number for the immigration surplus in a country like the United States, even after immigration has increased the size of the workforce by 15 percent. The formula for the immigration surplus contains another important insight: The gains from immigration are intimately linked to the wage loss suffered by workers. Ironically, the United States gains more from immigration the greater the drop in the wage of workers who compete with immigrant labor. This implication is analogous to the result from international trade theory that cheap foreign imports, typically seen as having harmful and disruptive effects on workers in the affected industries, often benefit the importing country. Finally, the formula reveals that the immigration surplus is a positive number as long as immigration causes some wage depression. In other words, the United States, on net, benefits from immigration. It is important to note, however, that immigration has other economic effects, such as the fiscal impact through expenditures in the welfare state, but these considerations are separate from the calculation of the immigration surplus. The immigration surplus focuses solely on what happens to native income as a result of the changes that occur in the labor market. If the wage elasticity is -0.3, native-born workers lose about 2.7 percent of GDP (which is given by 0.7 * -0.3 * 0.15 * 0.85). At the same time, native-owned firms gain about 2.9 percent of GDP (which equals 0.7 * 0.3 * 0.15 * 0.925). Since GDP is around $15 trillion, workers lose $402 billion while firms gain $437 billion. The small immigration surplus of $35 billion, therefore, masks a sizable redistribution from workers to the users of immigrant labor. Let me restate this point in a different way: If one wishes to believe that the immigration surplus in the United States is around $35 billion, it follows from the same calculation that the redistribution of wealth from workers to firms is around $400 billion. I should also add that the exercise is a short-run simulation, calculating the gains and losses before the economy adjusts in any way to the immigrant influx. The increased profitability of firms will encourage capital flows and the economy will expand until the “excess profits” disappears. As we saw earlier, under standard assumptions in the immigration literature, the supply shift will not have an impact on the average wage in the long run. Hence the model implies that immigration does not alter the price of labor or the returns to capital in the long run, and natives neither gain nor lose from immigration. In the long run, therefore, the immigration surplus must be zero. This “accounting” framework, of course, can be used to calculate the costs and benefits attributable to ilegal immigration specifically. For example, how much of the $35 billion net gain is due to the presence of illegal immigrants in the labor market? To answer this question, we need to know what fraction of the “effective” labor supply provided by foreign-born workers is attributable to undocumented workers. Although we do not have precise estimates of this fraction, it can be roughly approximated. For example, about 29.3 percent of the current foreign-born population is illegal (or 11.7 million out of 40 million foreign-born persons). It is likely, however, that illegal immigration, which is predominantly low-skill, makes a smaller contribution to effective labor supply than their share of the foreign-born population. 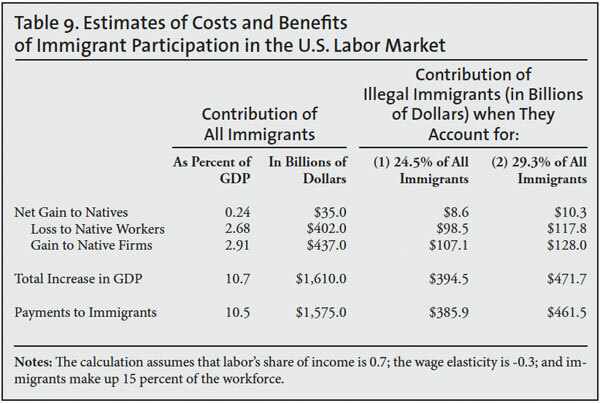 In fact, the simulation exercise in Table 3 suggests that ilegal immigration accounts for 24.5 percent of the effective workforce.24 These two estimates thus provide a bound for calculating the benefits and costs attributable to illegal immigration. In the short run, the percent change in the average wage resulting from a 1 percent increase in the number of workers must equal the negative of capital’s share of income. It is well known that around 70 percent of GDP in the United States is distributed to workers, so that capital’s share of income is 0.3. Therefore, a 1 percent increase in supply must lead to a -0.3 percent decline in the average wage in the short run. Equivalently, a 10 percent increase in supply must reduce the average wage by 3 percent. It is worth emphasizing that this prediction is implied by the algebra of the model and has nothing whatsoever to do with the underlying data. In the long run, the percent change in the average wage resulting from a 1 percent increase in the number of workers must equal 0.0 percent. As I emphasized in the text, the assumption that the aggregate production function in the United States is Cobb-Douglas is not innocuous. Nevertheless, it is an assumption that has been adopted in the theory-based literature that blossomed in the past decade. It is important to keep this fact in mind when interpreting the simulation results that are commonly presented in the academic literature. Angrist, Joshua D., and Alan B. Krueger. 1999. Empirical strategies in labor economics. In: Orley Ashenfelter and David Card, eds., Handbook of labor economics, volume 3, 1277-1366. Amsterdam: Elsevier. Autor, David H., Lawrence F. Katz, and Melissa S. Kearney, Trends in U.S. wage inequality: Revisiting the revisionists. Review of Economics and Statistics 90: 300-323. Aydemir, Abdurrahman and George J. Borjas. 2007. Cross-country variation in the impact of international migration: Canada, Mexico, and the United States. Journal of the European Economic Association 5: 663-708. Bonin, Holger. 2005. 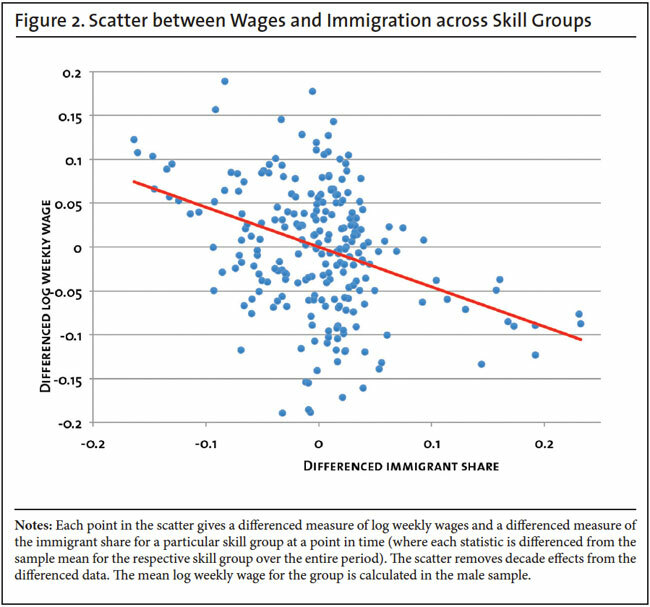 Wage and employment effects of immigration to Germany: Evidence from a skill group approach. IZA Discussion Paper no. 1875. Borjas, George J. 2003. The labor demand curve is downward sloping: Reexamining the impact of immigration on the labor market. Quarterly Journal of Economics 118: 1335-1374. Borjas, George J., Jeffrey Grogger, and Gordon H. Hanson. 2008. Imperfect substitution between immigrants and natives: A reappraisal. NBER Working Paper no. 13887. Borjas, George J., Jeffrey Grogger, and Gordon H. Hanson. 2010. Immigration and the economic status of black men. Economica 77: 255-282. Borjas, George J., Jeffrey Grogger, and Gordon H. Hanson. 2012. On estimating elasticities of substitution. Journal of the European Economic Association 10: 198-210. Card, David. 1990. The impact of the Mariel boatlift on the Miami labor market. Industrial and Labor Relations Review 43: 245-257. Card, David. 2009. Immigration and inequality. American Economic Review 99: 1-21. Card, David, and Thomas Lemieux. 2001. Can falling supply explain the rising return to college for younger men? A cohort-based analysis. Quarterly Journal of Economics 116: 705- 746. Goldin, Claudia and Lawrence F. Katz. 2010. The race between education and technology. Cambridge, MA: Harvard University Press. Grossman, Jean Baldwin. 1982. The substitutability of natives and immigrants in production. Review of Economics and Statistics 54: 596-603. Johnson, George E. 1998. Estimation of the impact of immigration on the distribution of income among minorities and others. In: Daniel S. Hamermesh and Frank D. Bean, eds., Help or hindrance? The economic implications of immigration for African-Americans, 17-50. New York: Russell Sage. Katz, Lawrence F. and Kevin M. Murphy. 1992. Changes in the wage structure, 1963-87: Supply and demand factors. Quarterly Journal of Economics 107: 35-78. Lewis, Ethan. 2012. Immigration and production technology. NBER Working Paper no. 18310. Mishra, Prachi. 2007. Emigration and wages in source countries: Evidence from Mexico. Journal of Development Economics 82: 180-199. Murphy, Kevin M., and Finis Welch. 1992. The structure of wages. Quarterly Journal of Economics 107: 215-326. Passel, Jeffrey and D’Vera Cohn. 2009. A Portrait of Unauthorized Immigrants in the United States. Washington, DC: Pew Hispanic Center Report. Ottaviano, Gianmarco I. P., and Giovanni Peri. 2006. Rethinking the effect of immigration on wages. NBER Working Paper no. 12497 (original draft). Ottaviano, Gianmarco I. P., and Giovanni Peri. 2012. Rethinking the effect of immigration on wages. Journal of the European Economic Association 10: 152-197. Steinhardt, Max Friedrich. 2009. The wage impact of immigration in Germany: New evidence for skill groups and occupations. HWWI Research Paper no. 1-23. U.S. Bureau of Labor Statistics. 2012. 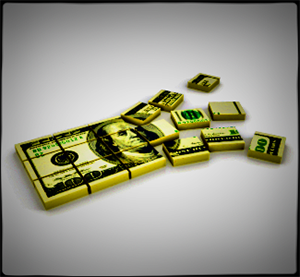 Employer Costs for Employee Compensation – September 2012. Washington, DC. Warren, Robert and John Robert Warren. 2013. Unauthorized Immigration to the United States: Annual Estimates and Components of Change, by State, 1990 to 2010. International Migration Review, forthcoming. 1 Grossman (1982) is the first study that directly addresses the empirical question. 2 See Murphy and Welch (1992), Katz and Murphy (1992), and Card and Lemieux (2001). 3 The analysis is restricted to persons aged 18-64, who do not reside in group quarters, and are not enrolled in school. 4 The calculation of the immigrant share uses data on total hours worked by immigrants and natives (rather than a simple body count), so it can be interpreted as the fraction of all work hours that is supplied by foreign-born workers. 5 More precisely, the points in the scatter diagram are the residuals from a regression of the group’s log weekly earnings and the immigrant share on a set of education-experience fixed effects and on decade fixed effects. The education-experience fixed effects ensure that each data point represents deviations from the mean observed for that group over the entire period while the decade fixed effects remove any decade-specific wage effects that are common to all groups. To better measure the price of a skill unit, the empirical exercise uses the mean log weekly wage of workers in the wage and salary sector. 7 In the sample of working men, the regression coefficient is -0.529. The implied wage effect is given by the product of this coefficient and (1 – p)2, where p is the immigrant share. Since the immigrant share in the U.S. labor force is around 15 percent, the multiplicative factor is around 0.7. See Borjas (2003) for details. 8 Although the discussion focuses on wage effects, immigration also has employment effects. Using a similar framework, Borjas, Grogger, and Hanson (2010) report that a 10 percent increase in supply lowers the employment rate of black men by 5.1 percentage points and that of white men by 1.6 percentage points. 9 Borjas, Grogger, and Hanson (2010) present an extensive analysis of the impact of immigration on the employment and earnings of the African-American population. 10 To estimate this parameter would require additional data specifying the nature of changes in the capital stock. Although it is possible to estimate the parameter using only wage and employment data, this methodology would not be robust since aggregate conditions in the labor market are only observed a total of six times (once in each census). where Q is output, K is the capital stock, and L is the labor input. If the labor market were competitive, the parameter α is the fraction of GDP that is distributed to firms (or around 0.3 in the United States). 12 The regression coefficient estimating the reciprocal of the elasticity of substitution across experience groups was 0.15 (with a standard error of 0.03). The regression coefficient estimating the reciprocal of the elasticity of substitution across education groups was 0.20 (with a standard error of 0.08). As suggested by the work of Autor, Katz, and Kearney (2004), the regression that estimates the elasticity of substitution across education groups allows for a post-1992 “spline” by including interactions between the education fixed effects and a linear trend, and interactions between the education fixed effects and an indicator that “turns on” after 1990. 13 Warren and Warren (2013). 15 Passel and Cohn (2009, p. 11) report that 47 percent of undocumented immigrants have less than a high school education, 27 percent have a high school diploma, 10 percent have some college, and 16 percent are college graduates or more. For each education group, the simulation assumes that undocumented immigration increased the supply of workers for all age groups by the same proportion. 16 Specifically, Borjas, Grogger and Hanson (2012) examine how cell-specific wages were calculated in the Ottaviano-Peri study. The latter used an extremely unusual definition: the log of mean earnings for a particular cell. The standard approach in the literature (which is consistent with the underlying theory) is to use the mean of log earnings. Borjas, Grogger, and Hanson also address the issue of how the observations are weighted in the regressions estimated in the Ottaviano-Peri study. 17 Ottaviano and Peri (2012) do not report the short-run wage effects. 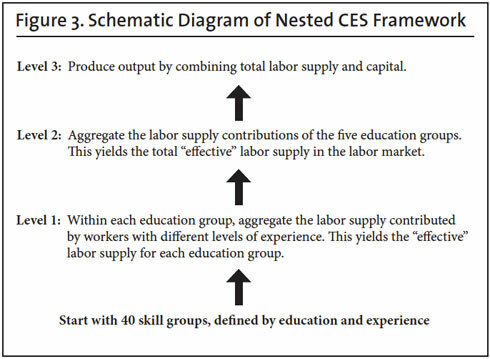 However, the algebra of the nested CES framework implies that it can be easily calculated from the reported long-run wage effects. In particular, the difference between the two effects (for any education group) must equal capital’s share of income (or an assumed 0.3) times the percent increase in total supply due to immigration (which their Table 1 suggests is slightly above 10 percent). Hence the short run wage effect exceeds the long run wage effect by around 3 percentage points. 18 See also Ottaviano and Peri (2012). 19 Goldin and Katz (2008) also examined the possibility that there may have been a linear decline in the value of this elasticity of substitution over the 20th century. Specifically, they add a few pre-1963 data points to the time series, and introduce a variable that interacts relative supply with the time trend, and the coefficient of this interaction is negative. As the table shows, however, the post-1963 Goldin-Katz data leads to an inverse elasticity that is significantly different from zero and numerically important. 20 Coincidentally, Alan Krueger happens to be the current Chairman of President Obama’s Council of Economic Advisers. 21 The formulas presented in this section are derived in Borjas (1995). 22 The formula implies that the total payment to immigrants equals $1.58 trillion. This prediction is very close to what immigrants actually received in terms of total earned income (plus benefits). The 2011 ACS indicates that immigrants received $1.008 trillion in total earned income (in February 2013 dollars). The BLS reports that wages and salary account for 69.2 percent of total compensation, implying that the total compensation received by immigrants is around $1.46 trillion. 23 The magnitude of the “net” gain accumulating to immigrants is given by the difference between their income in the United States and what they would have earned in the source countries had they not migrated. 24 The total labor supply shifts reported in the last column of Table 3 are a weighted average of the education-specific supply shifts, using income shares as the weights. Total immigration increased labor supply by 10.6 percent over the 1990-2010 period, while legal immigration increased labor supply by only 8.0 percent. Legal immigration, therefore, accounted for 75.5 percent of all immigration (or the ratio of 8.0 to 10.6), implying that undocumented immigration accounted for 24.5 percent. 25 The exercise summarized in Table 9 ignored the fact that the workforce is not composed of equally skilled workers. Several studies in the academic literature generalize the framework to allow for the existence of several skill groups. These generalizations of the basic model typically find that the immigration surplus is of roughly the same magnitude as that indicated by the simpler approach summarized here. See, for example, Borjas (1995) and Johnson (1998).